In the fifth and final part of our Ultimate Breaks and Beats breakdown, we dig into instalments 521 through 525. 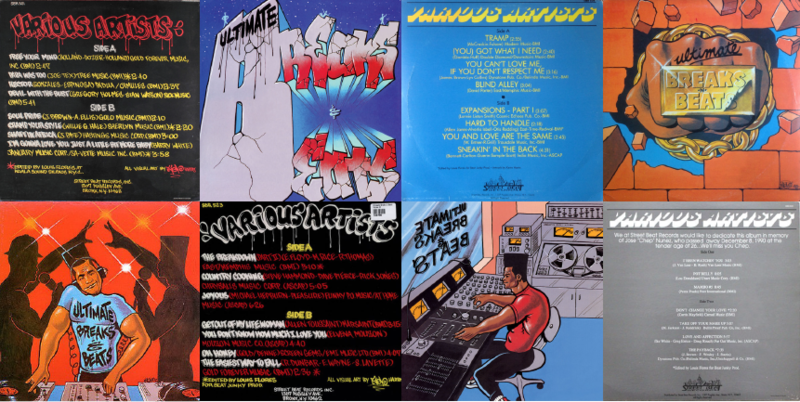 It’s not over just yet though: there’s a breakdown of the compilation series as a whole, which is less a track-by-track analysis and more a sweeping look at the influence, impact and chronology of BreakBeat Lou’s half-decade project! The numbers spike on SBR 521, which gets a little help from James Brown, Johnny Pate and Joe Tex. The latter is the wild card entry who, though seldom discussed alongside either Brown or Pate, saw through a period of continued failure before breaking out and winning fans with his brand of Southern soul. He too made a name for himself at the Apollo Theater in Harlem, but he died from a heart attack aged just 47. These three acts put up a good amount of the 882 flips on this one. The Politicians were an in-house band for Hot Wax and Invictus, and “Free Your Mind” was included on their sole album, The Politicians Featuring McKinley Jackson. “Free Your Mind” has been seldom sampled beyond a handful of oddities, most notable amongst them DJ Shadow’s “Lesson 4.” It also appeared in solo work by Public Enemy’s Professor Griff and a 1990 cut from Kid Rock. Next up: Joe Tex’s 1966 soul cut, “Papa Was Too.” The song was a ‘response record,’ or a song that riffed on the subject of another hit song, usually offering an alternate view of the same idea. Tex is here riffing on Lowell Fulson’s “Tramp,” which would also inspire The Mohawks’ “The Champ,” one of hip hop’s most frequent samples. Tex’s rendition has been sampled more than 280 times: think Wu, Jay Dee, ODB, Meth, EPMD + Ye. The Village Callers’ “Hector,” a 1968 cut from their only album, Live. The Callers were a seven-member crew who built a reputation as a live band throughout LA, playing clubs and managing residencies despite the fact they were underage. The titular “Hector” is presumably their manager, Hector Rivera. A good amount of the 11 samples are big: De La, Ice Cube, Beastie Boys, Cypress Hill and Redman. “Devil With The Bust” was included on Don’t Fight The Feeling, Sound Experience’s 1974 sophomore album. The nine-piece funk outfit formed in Baltimore in 1970, soon moving to Philadelphia and gradually shifting toward the reigning disco sound. “Devil With The Bust,” however, is funk through and through. It’s been sampled 10 times, appearing on tracks by familiar artists such as Public Enemy, Geto Boys and Compton’s Most Wanted. “Soul Pride,” like many a James Brown cut, features a malleable and much-utilised breakbeat. Brown’s funky blueprint of wailing horns, spirited ad-libs and isolated drum passages have made an indelible mark on hip hop. “Soul Pride,” though one of his less-famous breaks, has been sampled more than 100 times. You might’ve heard it on cuts from Aphex Twin, Digable Planets or DJ Shadow. All The People’s “Cramp Your Style.” The obscure group released nine songs over six seperate 7” singles in the early ‘70s, just one of which has been immortalised by savvy producers. “Cramp Your Style” is perhaps best remembered for underpinning the instrumental of Boogie Down Productions’ “I’m Still #1.” Elsewhere, it’s made appearances on jams by Cypress Hill, LL Cool J and Cannibal Ox. They say this guy Shaft is a bad mother— shut your mouth! I’m talking about Shaft, the ice cold hero from the 1972 blaxploitation film of the same name. Whilst Isaac Hayes handled the theme for that film, Johnny Pate wrote “Shaft in Africa (Addis)” for the third and final instalment of the original trilogy. “Shaft in Africa (Addis)” has more samples Hayes’ iconic theme, gracing more than 70 cuts, notably from Jay-Z, Diamond D and Jungle Brothers. Barry White, with his silky-smooth bass-baritone and bombastic vision of love, remains a dominating presence fifteen years after his death. “I'm Gonna Love You Just a Little More Baby,” released in ‘72, featured famous guitarists Ray Parker Jr. and Wah Wah Watson. It peaked at #3 on the Hottest 100. White’s tight arrangements and long instrumental stretches endeared him to sampling: this classic alone has been flipped more than 230 times. Though it certainly seems more antiquated, Tommy Roe’s “Dizzy” - a break-centric edit of which appeared as the ‘bonus beat’ on SBR 521 - was released in 1969, one years after The Village Caller’s “Hector.” Whilst that record was live jam-based funk, Roe’s single is unadventurous, family-friendly pop. Nonetheless, “Dizzy” has appeared on cuts by De La Soul, Nice & Smooth and Heavy D & The Boyz. SBR 522 holds the fourth and final sample-free inclusion, a disco cover that’s clearly failed to ignite creative revelations in the years since. There’s not particularly much to say here. A total of 336 flips. To start us off, a splash of latin rock from Madrid-based latin rock outfit Barrabás. “Woman” was issued as a single from their debut album, 1971’s Wild Safari, and quickly became their biggest hit. The group pivoted to disco before breaking up. Though a hit, it never quite took as a sample, and has been sampled just four times: by Dusty Springfield in ‘89, Plug in ‘95, Comoesta Yaegashi in ‘01 and Soul Providers in ‘03. Here’s an astonishing inclusion: Creative Source’s “Corazon,” a disco cover of the original by Carole King. In the late ‘80s, when this compilation was released, disco was well and truly out of style, with rock giving way to funk, soul and jazz sampling. Though Creative Source have experienced some popularity with producers and DJs - “You Can’t Hide Love” is their most sampled - their rendition of “Corazon” has actually never been flipped. Disco endured ruthless (and sometimes violent) opposition from elements of society, much of which was steeped in bigotry and intolerance. Nonetheless, disco breaks remained both popular and useful tools for producers, and Southside Movement’s “Save the World” is a great example. Examples of this utility can be found on tracks by acts as varied as Beastie Boys, Beck, Yo-Yo, 2Pac and Poor Righteous Teachers. The J.B.’s are amongst the famous backing bands of all time: they served James Brown throughout the early ‘70s, and counted several famous members in their too-stacked-to-recap lineup. “The Grunt,” included on 1970’s Food For Thought, is amongst their more frequently sampled cuts. It appeared on Public Enemy’s It Takes A Nation… three seperate times, as well as gracing tunes from Wu-Tang, 2Pac, The Pharcyde and Erykah Badu. “Do The Funky Penguin (Part 2)” is Rufus Thomas’ definitive hit: a perfect slice of dance-ready funk fused with all the appeal of the late entertainer’s outrageous, novelty-heavy gaze. Though “Part 2” has been sampled more than 50 times, the original version has accrued more than 100 flips. You can find the “Funky Penguin” - part 2, that is - hanging with Pete Rock, DJ Shadow, Madlib, Digable Planets or Prince. A Detroit-based funk rock outfit, Shotgun was founded by four former 24-Carat Black members. That group had recorded just one album, Ghetto: Misfortune’s Wealth, before disbanding. Ultimately, 24-Carat Black proved far more popular than Shotgun amongst producers. “Dynamite (The Bomb)” has been sampled just twice: once by DnB artist Plug in ‘95, and once by breakbeat artist Utah Saints in 2000. Gary Numan’s “Films” was included on 1979’s The Pleasure Principle, his debut solo album, released after three years as frontman of new wave band Tubeway Army. The album featured no guitars: Numan manipulated synths to achieve his sound. Though not as popular as “Cars,” another cut from that album, “Films” has been sampled just under 10 times. Most famous amongst them are flips from GZA, Leaders of the New School and Czarface. Much like that which preceded it, SBR 523 includes a dance jam from legendary soul singer Rufus Thomas. It also pays respect to one of the original architects of the soul sound, Solomon Burke, whose work is overshadowed throughout the series by James Brown’s runaway popularity as a sample source. This one manages 245, the third-lowest tally of the series. SBR 523 opens with yet another Rufus Thomas jam. “The Breakdown (Part II)” was included on 1971’s Stax-released Did You Heard Me?, his fourth studio LP. It would have dropped just prior to Thomas’ set at Wattstax, the huge benefit show that marked the 7th anniversary of the Watts Riots. It’s been sampled more than 60 times, and you might’ve heard it on cuts by Rae, Ghostface, Dre, Cube, N.W.A, De La, Ice-T and Queen Latifah. Jim Dandy, the oft-explicit lead singer of Southern rock outfit Black Rock Arkansas, is a washboard-playing cult figure. He contributed a cut to 1975 compilation Flash Fearless Vs. the Zorg Women, Pts. 5 & 6, an oddity that fused comic book narrative with rock music. Dandy’s “Country Cooking” has been sampled just once: on Sid & B-Tonn’s “Deathwish II,” released in 1990. A sudden change of pace, next up we have “Joyous,” a 1977 R&B track from Portland-based funk group turned sampling favourites, Pleasure. It was included on the record of the same name, the group’s third, and was produced by Wayne Henderson. “Joyous” has accrued 30 samples in the years since, notably alongside Eric B. & Rakim, Lakim Shabazz, Janet Jackson and Sugarhill Gang. If you came of age during the early 2010s, you’re likely already familiar with Solomon Burke’s seething breakup anthem, 1968’s “Get Out Of My Life Woman.” Burke - a founding father of soul - died in 2010, but his influence stays immeasurable. A South Carolina-born jazz muso, Alphonse Mouzon rose to prominence as a jazz fusion drummer in the early ‘70s. He was signed to Blue Note for three years, later forming his own label, Tenacious Records, in 1992. “You Don’t Know How Much I Love You” was included on 1974’s Funky Snakefoot, and since featuring on UBB, has been sampled by just one act: indie rap outfit Red Black and Green. British-based soul trio Delegation landed just one major hit in the United States, so it’s no surprise that it’s that song - 1977’s “Oh Honey” - that made the grade for UBB. In the years since, it’s been sampled nearly 100 times. It recently had a starring role on Ice Cube’s “Ain’t Got No Haters,” his 2018 Too $hort collab, and has otherwise graced cuts by Geto Boys, Kali Uchis, Knxwledge and a much younger Cube. “The Easiest Way To Fall” was included on Freda Payne’s Band of Gold, also featuring as the b-side to the smash hit title track. Produced by the famed Holland-Dozier-Holland trio and featuring writing from various songwriters and Motown alumni, the record marked her commercial peak. It’s since been sampled more than 30 times by the likes of Beck, Beastie Boys, Raekwon, Wu, De La, DJ Shadow and Pizzicato Five - three times! The inclusion of Lowell Fulsom’s “Tramp” completes a trifecta of oft-sampled tracks with interrelated origins. “Tramp,” released in 1966, prompted a response record, Joe Tex’s “Papa Was Too,” released the same year. “Papa Was Too” appeared on SBR 521, but it was The Mohawks’ “The Champ,” released in ‘68, that experienced the most success. That altered cover appeared on SBR 512. Funnily enough, that’s the exact number of samples lifted from the cuts on this penultimate instalment: 512. It’s only right that Lowell Fulson earns an inclusion, though it’s curious that it took until SBR 524 for it to come about. Fulson’s “Tramp” is like a musical schematic: though not as well-known as the ensuing cover, it provided the base from which The Mohawks penned “The Champ,” a storied sample. “Tramp” has since racked up nearly 50 samples, from acts such as EPMD, Cypress Hill, Prince and Joe Tex, whose answer record was on SBR 521. The title alone should give this one away. Freddie Scott recorded “(You) Got What I Need” in 1968, and whilst the Gamble & Huff-produced single made #27 on the Hot R&B Songs chart, it wasn’t until the late ‘80s that it became an anthem. Biz Markie’s “Just A Friend” interpolated Scott’s earworm of a hook, changing a love song to a desperate (and uplifting) lament. Kanye and Ghostface later incorporated some subtler flips. Lyn Collins’ “You Can’t Love Me If You Don’t Respect Me” is another relatively obscure funk cut that’s become an infrequent sample. It was included on 1973’s Female Preacher, produced by James Brown himself and released on Brown’s shortlived People Records. It was first sampled by Queen Mother Rage, but later appeared on cuts by EPMD, The Game and Eightball and mid-’90s French group Up Town. Six-piece R&B vocal group The Emotions make a long overdue appearance on SBR 524, leading with their 1971 cut, “Blind Alley.” That song was included on their second album, which preceded their commercial apex - “Best of My Love” - by a whole six years. “Blind Alley” has beens sampled more than 150 times: we’re talking Big Daddy Kane, Pete Rock, Tribe, The Pharcyde, 2Pac, Gang Starr and Rakim. Lonnie Liston Smith is both a pioneering jazz musician and a staple of hip hop culture, having innovated in fields such as acid jazz and fusion whilst also directly collaborating with emcees. His appearance on Guru’s Jazzmatazz, Vol. 1 was a consequence of his popularity amongst producers. “Expansions,” the title track from his 1973 LP, has been sampled just over 15 times by acts such as Stetsasonic and DJ Q-Bert. Released just six months after the plane crash that took his life, Otis Redding’s “Hard to Handle” was one of his biggest posthumous hits. It was included on The Immortal Otis Redding, which was largely comprised of work from Redding’s final studio sessions. The track has since accrued over 30 samples, including appearances on jams by Marley Marl, Masta Ace, 2 Live Crew and The Diplomats. The Grass Roots were founded by record executive Joy Alder and songwriters P.F. Sloan and Steve Barri to capitalise on the folk-rock wave of the mid-’60s. The third incarnation proved the most popular, and “You and Love Are the Same” appeared on 1968’s Feelings. Creed Bratton - of The Office fame - played guitar on the track. It’s been sampled just 16 times as of writing, by acts like Young Jeezy and Freestyle Fellowship. In 1973, LA-born saxophonist Tom Scott linked up with jazz fusion outfit L.A. Express for a collaborative LP, inspiringly titled Tom Scott & The L.A. Express. The L.A. Express would soon join Joni Mitchell in the studio, and Scott would later become a founding member of the Blues Brothers. “Sneakin’ In The Back” has been sampled over 200 times by acts such as 2Pac, Lords of the Underground, Massive Attack and Wiz Khalifa. Ultimate Breaks and Beats closes out in typical fashion: with a little jazz, a little soul and a side of James Brown’s funk. Whilst “The Payback” is one of the most sampled songs in history, SBR 525 is filled with fantastic cuts that have backed more than a handful of subsequent tracks. When I ran the numbers - which are ever-changing, albeit slowly - “The Payback” represented 389 of the 695 samples taken from the compilation. You’ll probably remember Southside Movement from SBR 522, which included their 1974 track “Save The World.” The final instalment of UBB opens with “I’ve Been Watching You,” a hit single from their subsequent 1975 LP, Moving South. It would be the last release from the Chicago band. “I’ve Been Watching You” has been sampled just under 10 times, most notably by acts like Beastie Boys, Hieroglyphics, DJ Shadow and Diamond D.
A young Lou Donaldson was introduced to the bop scene whilst training for the Navy during World War Two. In 1950, the saxophonist made his jazz record debut, and soon enough he was signed to Blue Note. “Pot Belly” was included on Pretty Things, a 1970 LP that featured Blue Mitchell, Lonnie Smith and Idris Muhammad. “Pot Belly” has been flipped by more than 70 acts, including Dre, Guru, Main Source, Tribe and Cube. Mysterious latin group Samba Soul recorded four studio LPs between ‘77 and ‘79. “Mambo No. 5” was included on their self-titled debut, recorded by RCA Records in Brazil and subsequently mastered back in New York. When Steve Lacy sampled the group in 2017, it was their first flip in 15 years. It’s been sampled just four times: first by Busy Bee in ‘88, then by KMD in ‘91, Lord Finesse in ‘92 and Jurassic 5 in ‘02. The Five Stairsteps were a Chicago-based family soul outfit throughout the ‘60s and ‘70s. The group had their big break when they met Curtis Mayfield, who signed them to his Windy City imprint, though the group would sign with George Harrison’s Dark Horse records after being introduced to The Beatles through Billy Preston. As for “Don’t Change Your Love”? Kendrick, Tribe. Biggie, Cube, Kurious, Del, and a good 200 more! The track was sampled 3 times on The Avalanches’ Since I Left You, a dense classic of sampledelia. Ike White is an enigma. The clearly accomplished soul singer recorded his only album, 76’s Changin’ Times, from inside the California Correction Institute. Closing track “Love & Affection” is the extent of White’s sampled work, and there’s seemingly no information on what became of the musician. That track has graced 8 songs, amongst them cuts by O.C. & Buckwild, Cube, Snoop and DJ Quik. How do you close out a five-year, 25-instalment long breakbeat compilation series? James Brown, of course! Brown’s “The Payback,” the title track from his 1973 LP, has accrued nearly 400 samples. It was first flipped by acts such as N.W.A, Big Daddy Kane and King Tee in ‘87, and has since appeared on jams from Kendrick, EPMD, Madlib, Jodeci, Mary J. Blige, Das EFX, 2Pac, Prince, Yo-Yo, Ice-T and Kool Keith.